What Are the Differences in Football & Basketball? According to a 2011 Harris Interactive Poll, football is the most popular sport in the United States, with basketball checking in at third. However, the similarities between the two sports end there, as the two have little in common besides being two of the most popular team sports. Both basketball and football are played with leather or composite leather balls, but the similarities end there. Basketballs are round and give a good true bounce every time. They have even become smart devises. The 94Fifty has sensors in the ball's exterior which can transmit data in 100 milliseconds to an Android device. Footballs have an oblong shape and take some weird bounces when they hit the ground. The football's shape is designed to fly better in the air and be easier to catch. In addition, basketballs are larger and heavier than footballs. Basketball courts are much shorter and narrower than football fields. According to the National Basketball Association, regulation basketball courts measure 94 feet by 50 feet. I Sport notes that professional football fields are 120 yards by 53.3 yards, or 360 feet by 160 feet. Indoor basketball courts usually are made of wood, while football fields use natural grass or a synthetic. Both basketball and football are considered team sports since there are several people playing at once. Basketball teams are permitted to play with five players on the court at one time, while football teams play with 11 at a time. Basketball teams usually have between 12 and 15 players on the roster, while football rosters can range from 50 in professional play to 85 in college games. Football and basketball have decidedly different styles of play based on the rules. Football is a full-contact sport, with tackles and physical confrontations and collisions on every play. Basketball is considered a non-contact sport and by rule physical contact in basketball is a violation that can result in a foul. Basketball games are more high scoring than football even though basketball teams are awarded only 2 or 3 points for a made field goal and 1 point for a made free throw. Football grants 6 points for a touchdown, 3 points for a field goal and 2 points for a safety, but scoring is much less frequent than in basketball. Football games are played for significantly longer times than basketball games. 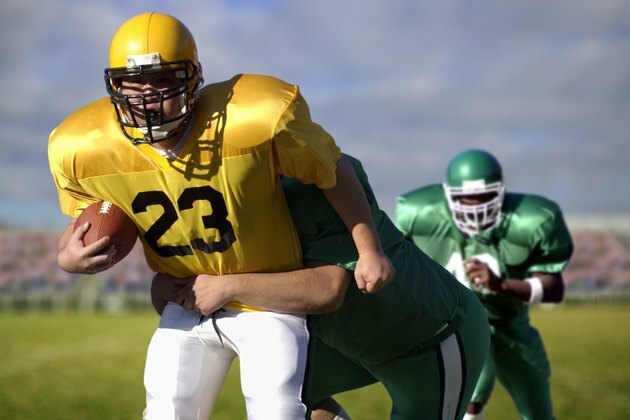 Football games at the professional and college level have 60 minutes of game play, while high school football plays 48-minute games. Basketball plays 48-minute games at the pro level, 40-minute games in college and 32-minute games in high school. It is important to note that both football and basketball games have several stoppages due to timeouts, fouls or penalties and halftime, which means both last much longer than the game play time. What Is the Difference Between Hard-Ground & Firm-Ground Soccer Cleats?